I thought I was finished with Vietnamese posting and ready to move on when I got my hands on this interesting record. After discussing the record with Jason Gibbs I decided it was worth posting. Most of the information in this post comes from him. 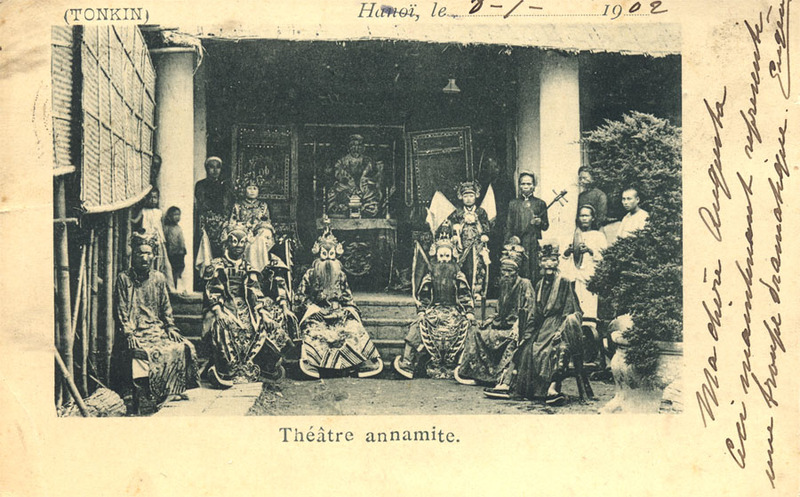 Hát bội (or tuồng theatre) is a form of Chinese opera imported into Vietnam as early as the 13th century. 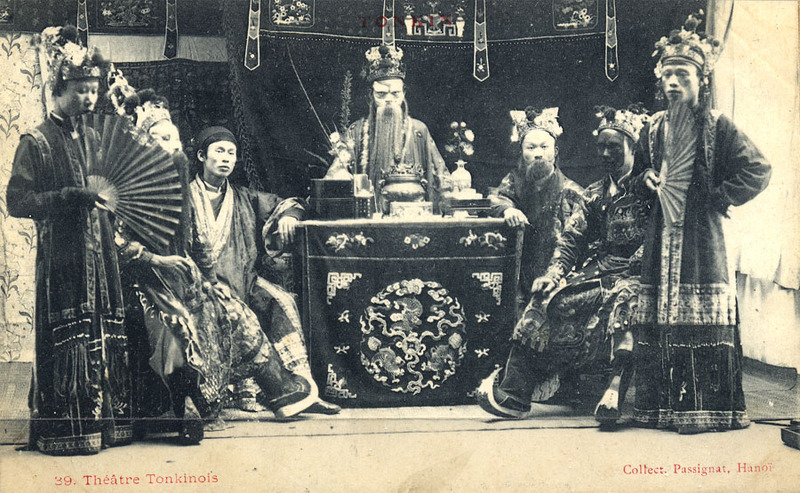 It uses costumes, gestures and stock characters similar to Chinese opera. The double reed instrument is the kèn, similar to the Chinese suona. By the 1950s, the communist government in the North was issuing records of folk music and opera with propaganda lyrics. 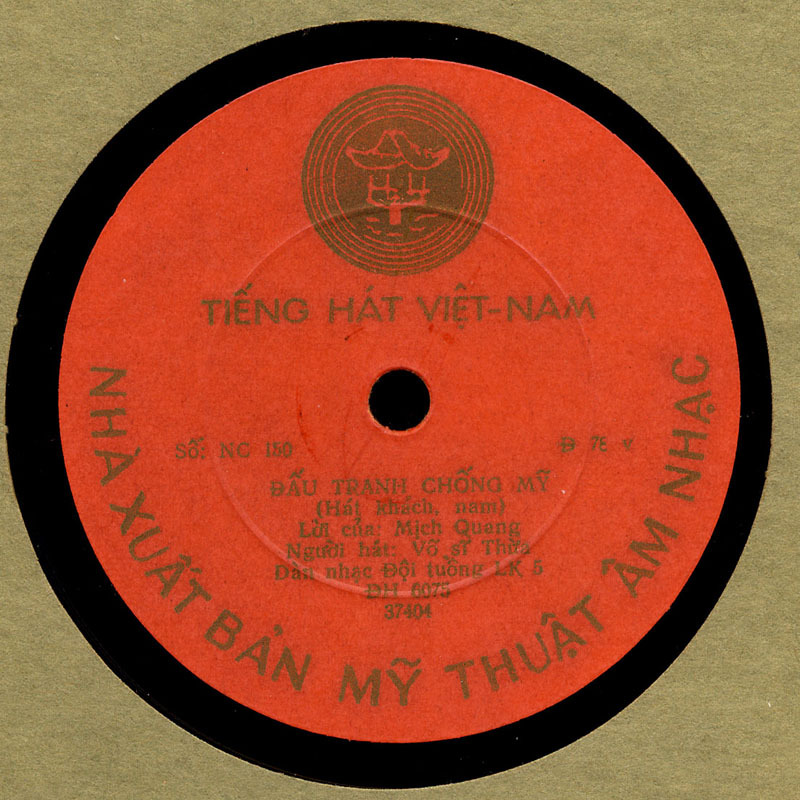 The song is entitled “Đấu tranh chống Mỹ” – “Fight Against America.” It is sung in the khách and nam modes of the tuồng theatre repertoire. The words are by Mịch Quang and are sung by Võ Sĩ Thừa. 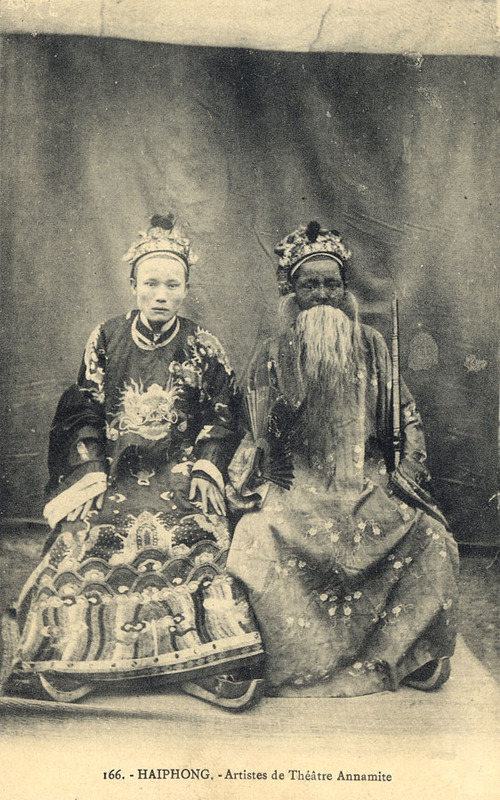 The music is played by the surrealistically named Dàn Nhạc Đội Tuồng LK 5 (The Ensemble of the Tuồng Troupe of Interzone 5). The 5th Interzone consists of Quảng Nam, Quảng Ngãi, Bình Định and Phú Yên provinces — the coastal region between Đà Nẵng and Túy Hòa. The significance of interzone is showing the solidarity between those who regrouped to the North with their comrades still below the 17th parallel (the Bến Hải river). They sing in the dialect and musical style of that region. The Bến Hải River marked the demarcation of the border between North and South Vietnam at the 17th parallel. 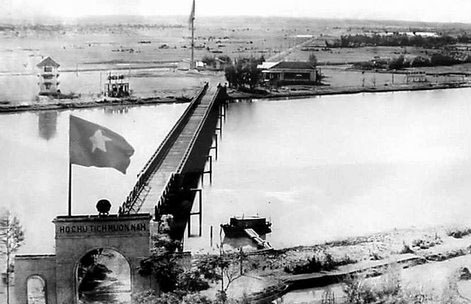 The much evoked landmark for this border was the Hiền Lương bridge that crossed this river. The below photo shot from the North show a gate to the bridge with the words: Hồ Chủ Tịch muôn năm – Premiere Hồ Forever. Thanks again to Jason Gibbs! Very nice to see your pictures and listen to the recordings! I have a short comment on the tuong record. It sounds to me that the tune is Hat Khach, played in the nam mode, i.e the anti-american lyrics is just one of many possible lyrics one could use for hat khach, and hat khac could be played in several different modes. The speed and the lack of deep vibrato almost make it sound as they are playing Hat khac in the bac (sometimes called khach as well) mode, even though some twists definitely sound nam. The speed might of course be part of the new revolutionary style of tuong.